Sara DuMond, M.D., is a board-certified pediatrician in private practice in Mooresville, N.C. She has been practicing medicine for 10 years, and has been a health and medical freelance writer for the past six years. She has published articles for "American Baby" magazine, Parents.com, and KidsHealth.org. 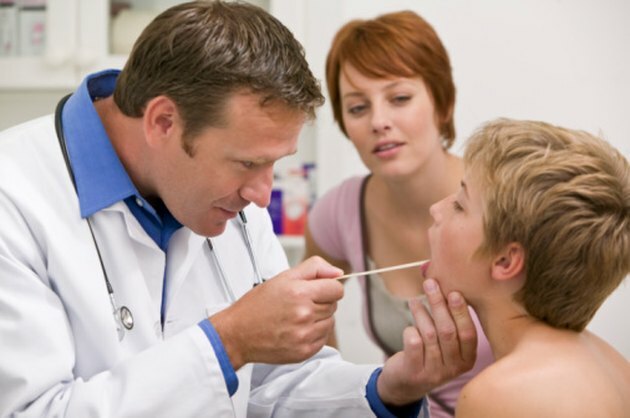 A white coating on a child’s tongue can be caused by underlying medical conditions. Often parents will wonder if a white coating is simply normal food residue on a child’s tongue. A simple swipe of the tongue with a wet washcloth will help determine if the white coating wipes away. If it doesn’t, or if wiping of the white coating causes irritation of the tongue, it is likely an indication of one of a few different conditions. Thrush is a yeast infection that occurs in the mouth. It causes a white coating on the tongue as well as white patches on the insides of the lips and cheeks and on the gums. It is most common in babies under the age of 1 year, due to their immature immune systems. It is contagious, especially in children who share bottles or pacifiers. Older children who have compromised immune systems from underlying medical conditions sometimes develop thrush. Children who use a corticosteroid inhaler for asthma are also susceptible to getting thrush. It must be treated with an oral anti-yeast medication. According to a 2004 review article published in American Family Physician, one of the characteristics of scarlet fever is a “white strawberry tongue.” It will look like a white coating, and the taste buds underneath may become somewhat swollen, causing a berry-like appearance to the tongue. The white coating associated with scarlet fever rarely occurs by itself. Most of the time, children with scarlet fever will also display other characteristic symptoms such as fever, sore throat and rash. Some children have a normal variation in the appearance of the tongue that looks like swirling white patches, referred to as a “geographic tongue.” A 2007 article in American Family Physician cites the incidence of geographic tongue to be between 1 and 3 percent of the general population in the United States. The cause of geographic tongue is unknown and it has absolutely no medical implications. The white swirling patterns on the tongue may migrate from one pattern to another over time. A common childhood virus, coxsackievirus, often causes white “spots” on the tongue. They are actually painful ulcerations caused by the virus. These white spots on the tongue usually last three to five days and go away on their own without any medical intervention. They are contagious, so children suspected to have coxsackievirus should be careful not to share drinks, utensils or saliva with other children. What Causes White Spots in the Throat?